I love Twitter for a lot of reasons (community building, outreach, networking, finding great content), but one of best quick-and-dirty ways to show an academic the power of Twitter is to crowd-source advice on an important topic. A couple of weeks, ago, Sandra Chung at NEON and I were invited to National Science Foundation headquarters to talk to the Division of Environmental Biology about the power of social media for creating a home for important conversations. To do this, I decided to create a hashtag, #firstgrant, and ask for advice from my Twitter followers for first-time grant writers. Over the span of two days, I had dozens of responses, which in itself is a testament to the power of Twitter for generating useful conversations that academics (among others) can use to their advantage. I could have gone with a silly example, but I decided to go with #firstgrant so that a useful product could be generated. Normally, I’d use Storify to collect the tweets, but Twitter only archives tweets for about a week, and I dropped the ball. Luckily, there are alternatives for archiving, like Topsy, which I used to collate the advice that follows. You can read the original tweets here if you’d like. 1) Read the instructions. I was shocked by how many folks who have reviewed grants brought this up. Grant-writing is an incredible amount of work, and it’s hard to imagine shooting yourself in the foot by not following a basic requirement. 2) Make use of your mentor network! Look at funded– and unfunded– proposals. Drug Monkey Blog reiterates this point here. 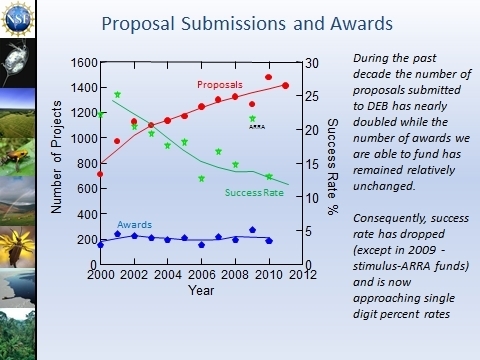 Funding rates versus proposal submissions for NSF-DEB. As funding rates decline, it becomes more and more critical to make sure that your proposal is as strong as it possibly can be. 3) Write clearly and succinctly, and use headings and white space to make it easy for reviewers to find what they’re looking for. This may seem like an obvious bit of advice, but it came up from a number of tweets. Several people referenced the fact that reviewers are overworked and/or likely to skim your proposal. 4) Know which parts of the grant are the most important, and really nail those. 5) There’s a joke that you write grants to get funding for the work you’ve already done, but there’s some truth that– preliminary data help show that your project can be successful, and that you’re capable of delivering. 6) Have clear, easy-to understand methods– especially keeping in mind that your proposal will likely be read by a non-expert. 7) Realize that you will almost certainly not get the money you’re asking for, so be strategic and try to anticipate things that will be cut. 8) Reach out to program officers and directors, participate in reviews, and get your name out there. I was also pointed to a number of other resources, including this set of slides by Russ Altman at Stanford (thanks, @andrewsu!) and a list of publicly avilable grant proposals in the biological sciences by Jabberywocky Ecology. If you’re interested in reading more about NSF-DEB’s new pre-proposal process, you can read a guest post on this blog by Jack Williams here. Feel free to add other advice in the comments! great post! here’s something to add, as stated by my advisor (not on twitter): “grant proposals aren’t mystery novels”. his point was that you can’t slowly bring reviewers to your points, at all allowing them to connect the dots on their own. you have to lead them everywhere you want them to go and don’t allow their brains to go anywhere else. a real help in this is being explicitly clear about your objectives by the end of the first page of the full proposal. Great post Jacquelyn. A lot of good advice that seems just as well suited to a job application as it is to a grant proposal! I’m bookmarking this post for sure.